Apple Jack Creek: Ravelry Spinning : I won a prize! The Spindle Candy group on Ravelry has a monthly challenge thread, which is great inspiration to get you spinning. For most of the year, you set yourself a goal (anything – so long as it has to do with spindle spinning) and update the thread with your progress towards meeting the goal. Anyone who meets their goal (which can be revised over the course of the month and can be anything from “spin five minutes a day” to “get the hang of drafting” to “spin up this batt”) is eligible for a prize drawn at the end of the month. Over the summer, things are a bit more relaxed … everyone still spins and shares their progress, but prizes are just drawn at random throughout July and August. Well, lucky me, I won one of the prizes in July, a lovely batt of camel/silk/angora from IxchelBunny in Australia. 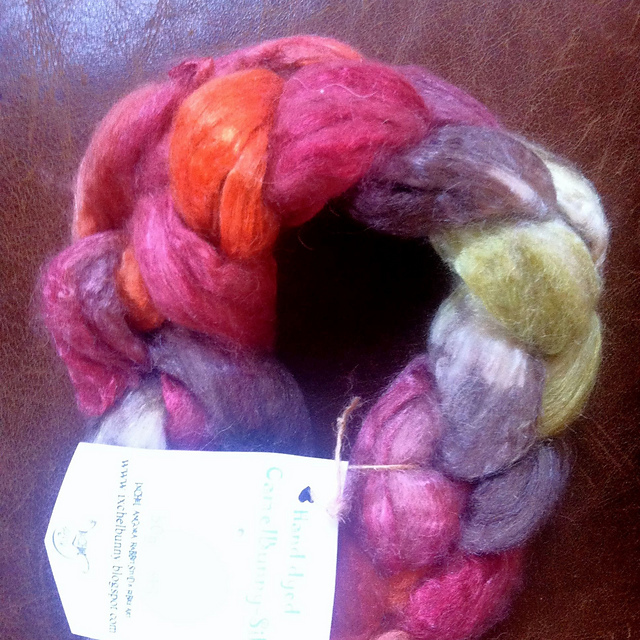 I have another prize coming to me too – I won a little teacup spindle in a Tour de Fleece drawing. I’m excited to see it! I got to send out some prizes too – some Canadian Rovings have gone off to a spinner in the US, a copy of my book went to someone else, and yet another spinner selected a copy of the Memory Shawl pattern (the prize was one of any of my Ravelry-published patterns, and that’s the one she picked). Such fun! The colours are beautiful! Congratulations. So happy for you - this looks like a lot of fun - wonder what it wants to be? Actually, it's so soft I suspect it wants to be a cowl or a scarf, something you can wear right up against your face. Camel and bunny and silk? Suuuuuuuuuper soft.